My host in Sweden, Ingrid, served me horseradish soup one of the last nights, and I loved the peppery creaminess of it, so I roughly recreated the recipe yesterday for my Dad. From Epicurious and altered. Ingrid said she bought it at the store and re-heated. 1. The hard part is finding fresh horseradish. Whole foods had it. Peel then grate 1 1/2 cups. 2. Chop 2 big Yukon potatoes, dice some fresh dill, and a few shallots. 3. Saute with olive oil, and a bit of butter for 20 mins. 4. In big pot add stock (I used chicken) and all of the stuff from the saute pan. 5. I deglazed the saute pan with a few cups of water, and added that to the soup pan. 6. Simmer for a while. At some point mash up the potatoes. I added a 1/2 cup of milk, some butter, and a few tablespoons of sour cream. 7. Season to your own taste & serve, or let sit and simmer to make it even better. Sorry no photos of soup available! I had to drive up to San Francisco before it had completed sitting and melding flavors. Really. 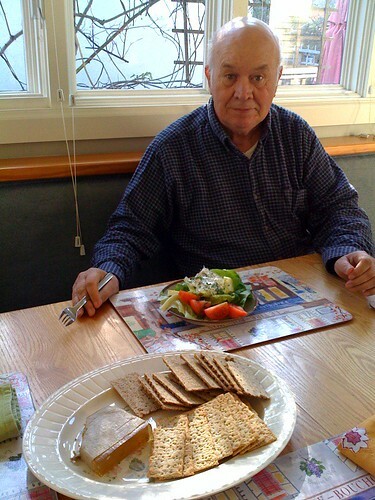 The photo above is my Dad, recovering nicely, fish salad, and pate and Wasa bread. I know fish salad sounds unappetizing, but it’s oddly filling and tasty. I got this recipe from Time/Life country cooking books, a 1950s collection of different regions and their cooking styles. This is named a Norwegian fish salad, but I swear it resembles a shrimp cocktail I got in Malmö. This is a rather light spread for lunch, which I discuss below. Dad wasn’t into lingering over coffee, which would have been an even more accurate cultural replication of Swedish lunch. 4. Make 2 hard boiled eggs. Cut 2 fresh tomatoes decoratively. Chill a few plates with big leaves of butter or boston lettuce. 5. Arrange fish chunks with sauce on lettuce, slice eggs, and add sliced tomatoes. Sprinkle leftover dill over the salads. My hosts in Sweden served frozen fish they’d caught from the lake, and made another fish recipe the first night I was there, and sadly didn’t notice the seasoning! The lunchtime meal is the biggest, and sometimes dinner will just consist of dinner rolls and coffee. 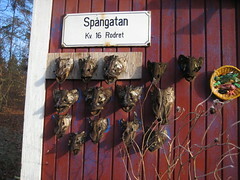 This is traditional of course and their sons do different meal arrangements (as did people in Stockholm). The “salad” was basically code for any cold dish before the main dish. In nicer restaurants I’d order a herring or salmon salad that was a stack of vegetables, potatoes, and fish, but all cold. Russia did the same kind of “first course” that was a cold one, with caviar or some other expensive fish, and then potato or starch and strong seasoning. From that time/life book I read that sour cream was actually introduced by Americans during world war II. The Danes, the best at dairy products, used a different kind of fermented yoghurty/cheesy tart sauce before that. Written Friday, January 30th, 2009 in beer & chocolate, food, nostalgia, travel. You can leave a response, or trackback from your own site. A traveler deserves a good food such as this. So nutritious that you will keep on wanting more. Mere looking at the recipe makes me think I should try this at home (lol). This blog provides detailed information about fitness and how to being fit.. I have been looking for a blog like this for past many months.. The points mentioned in this article are very valid..